Infinite Slope v. 3.0 theoretical basis. Free body scheme of a vertical slice. - theory of unsaturated soils is not taken into account. 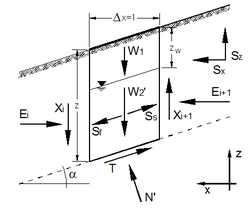 - Ss the stabilizing force (supported by the shear pile walls). The model is suitable to perform stability analyses of slopes that satisfy the above hypothesis, which means soil masses constituted by layers parallel to the slope and in any case where the failure surface is expected or known to be planar and parallel to the slope. For slopes constituted of homogeneous fine grained soils this model is often not suitable to obtain a correct interpretation of failure mechanisms (circular and not planar) and isn't able to evaluate a correct factor of safety for the slope. If groundwater flow is present seepage direction must be parallel to the ground surface. This software has been verified by manual calculations and has been compared to other commercial codes giving a good agreement of the results. Nevertheless, the author cannot assume any responsibility about the use of its results. Publications concerning the 'Infinite slope' model.